Give your kids the gift of Skiing! I can still picture my mom picnicking atop her favorite trail, Chilcoot at Smugglers’, after making runs with me. She would visit with her fall line friends while my teenage brothers and I would continue to ski laps. When I was only about eight, I remember watching my brothers build jumps and fly off them at Gunstock. 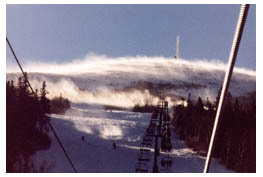 Later, when we were in high school, I recall early morning road trips to ski races around New England. Many of my best memories growing up surround skiing. I believe now my kids are creating their own alpine archives. Our best times as a family have been on the slopes. One of us can mention a particular ski run on a specific day and we all get our grins on. Just the mention of the bumps on Thrasher at Park City’s Canyons in Utah or that -20F day at Sugarloaf and the whole family flashes back to that moment when we mastered the mountain elements together. Giving your child the gift of skiing is providing them a lifetime sport that they can share with you, and then with their own children. Introducing snow sports gives your kids an outdoor outlet in winter, that sure beats being inside. Skiing is a rare sport because you can do it with your kids, and your grandkids for that matter. That doesn’t mean you have to teach your kids to ski. 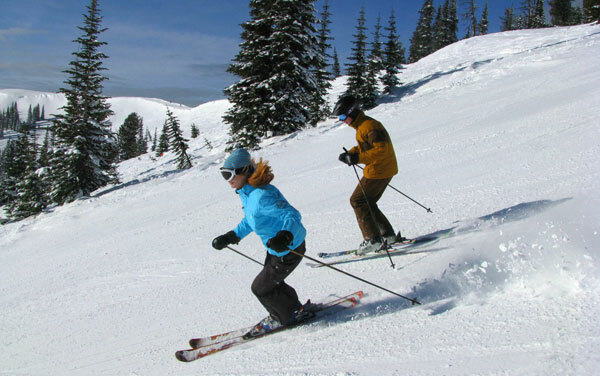 Being a competent skier does not automatically make you an accomplished instructor. You aren’t a better parent because you taught your kids every aspect of the sport. You need to find the right balance between professional instruction at resort ski and ride kids camps and making turns with your tot so that it’s a positive experience all around. Once the basics are mastered, pizza pie to French Fries, you will share in the triumph of linking a trail’s worth of turns side by side. As you slide up the color chart with your child, from Green Circle to Blue Square to Black Diamond, you create an inseparable bond – like skis to snow. I remember our kids’ first powder day, watching them go from hesitant to huge snowy smiles. What my kids have taught me in exchange, which we forget as adults, is the joy of falling. Kids tend to have a wacky attitude about wipe outs, they find falls to be quite funny and worthy of laughable labels from face-plant to biting the dust, to yard sale. Skiing is one of the greatest gifts my parents gave me. I appreciate that they started me so young (3), and I now know that took effort and commitment on their part. You learn that as a parent when history repeats and you are hauling your kids and heavy ski gear to the snowy slopes, and again when you take your senior parents skiing. I have since thanked my folks for giving me a sport for a lifetime – and I still enjoy skiing with my Mom, my brother, and my kids. And in their awkward teenage way, my kids show gratitude for introducing them to the forever young sport of skiing, especially when we are planning that big family ski trip out west.